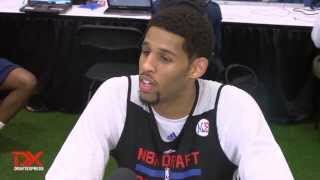 With Cal losing in the NCAA tournament Round of 32 to Syracuse, junior Allen Crabbe announced shortly after that he would forego his senior season and declare for the NBA draft. Standing 6'6" with long, wiry arms, Crabbe has good size to play the shooting guard position in the NBA, although he could stand to add a little more strength. While not an explosive athlete, Crabbe is very quick, both in the open court and when running off screens in the half court. He gets a good amount of his offense in transition, where both his ability to streak out and finish as well as his ability trailing the break provide him with scoring opportunities. Crabbe's primary asset on the offensive end is his shooting stroke, where he has excellent form, elevation, and touch, with range beyond the NBA three point line. Crabbe is very good as a catch and shoot threat, something which he should be able to translate to the next level immediately. Overall, Crabbe shot 44.1% on catch and shoot opportunities according to Synergy Sports Technology, which in and of itself is already a very good mark. However, due to Crabbe's role as the focal point of the Golden Bears offense, a disproportionately high percentage of these came with a hand in his face. While Crabbe does do a very good job of maintaining focus and has the high release point and elevation to convert these shots while well defended, when he's less of a focal point of an offense this weapon could become even more dangerous with more space to operate. According to Synergy Sports Technology, Crabbe shot an astounding 53.8% on unguarded catch and shoot opportunities, something which should allow him to easily find a role in virtually any offense. Unfortunately he didn't see enough opportunities like that this season for Cal, as he attempted three times as many shots with a hand in his face and/or shooting off the dribble. His overall 3-point percentage this season was just 35%, after shooting 40% in each of the last two seasons. Crabbe is also an excellent shooter coming off screens and curls. He does a very good job of using his speed and takes tight angles coming off screens. More impressively, Crabbe has an incredibly quick release that requires very little time and space to get off, with excellent balance and footwork when preparing for the shot. This once again should make it relatively easy to design plays to get Crabbe quality looks in virtually any offensive set. When asked to put the ball on the floor, you start to see some of the deficiencies in Crabbe's game. An overall below-average ball handler for a wing player, without great passing instincts, Crabbe struggles to create off the dribble for either himself or his teammates. He doesn't do a great job using his off hand or changing directions with the ball, and generally looks out of his comfort zone after more than one or two straight line dribbles. He shows some ability to shoot off the dribble, mostly in the form of pull-up jump shots as defenders close out on him or after one dribble to his left. His lack of perimeter ball handling ability limits him greatly in this regard, though. When Crabbe does get into the lane, he shows good touch on both his pull-up jumper and a floater in the lane, allowing him to score relatively efficiently with his relatively rare forays into the paint. He's not an explosive leaper and does struggle at times finishing through contact, and overall does not seek out contact all that much, resulting in a below average 4.6 free throw attempts per-40 minutes, which ranks 14th among the 21 collegiate shooting guards in our Top-100 prospects. On the defensive end, Crabbe has good length and moves his feet relatively well. While he could stand to continue adding more strength, and at times can be bullied physically, he has the physical tools to provide some value on the defensive end. However, Crabbe can fairly frequently lose focus on this end of the court, leading to a high center of gravity and an inability to change directions quickly, and he can also lose his man off the ball at times, These are mostly correctable problems, and if a coach is able to get him to consistently focus on this end of the court he has room to improve defensively. stop being so passive), have noted that Crabbe could stand to be more aggressive on the offensive side of the court, and he can appear to coast at times. Scouts have frequently questioned his lack of mental and physical toughness-- both major question marks he will have to dispel during the draft process. Most of the questions about his aggressiveness would appear to be in relation to him being an offensive focal point, as he was fairly quick and decisive in catch and shoot situations and when coming off of screens. If Crabbe is asked to fill a more complementary role at the next level, his incredibly quick and accurate release should allow him to fit an offensive system very easily, especially if a coach is able to get even average defensive effort out of him consistently.